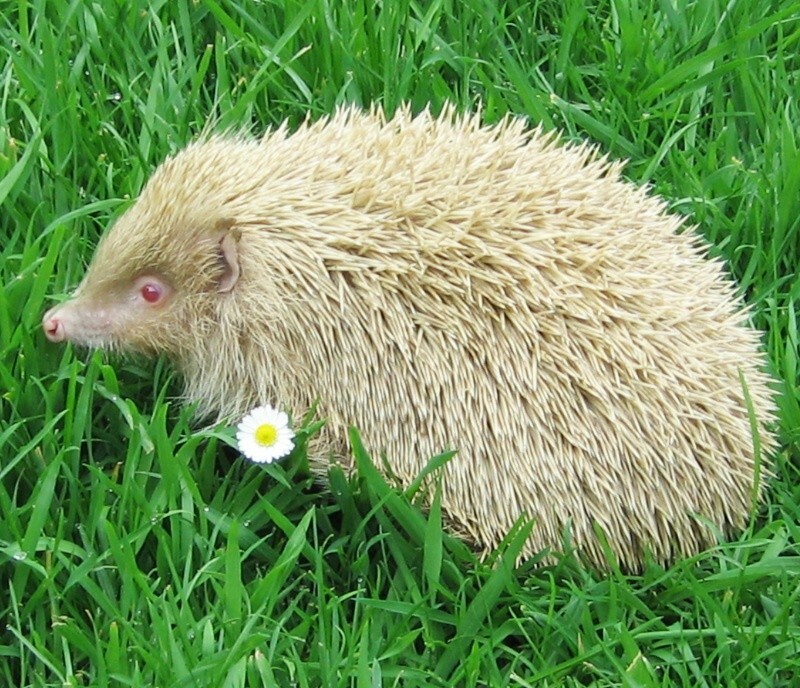 Many of you will remember Becky, our special albino hedgehog we rescued six years ago and have been caring for ever since. Last year we reported how she had found her new role in life as a ‘foster Mum’. Any orphans we had hand-reared which then needed outside experience before going on to be released, we put in Becky’s garden. There she guided the youngsters, showing them ‘the ropes’ on how to survive in the wild—foraging for natural food, nest-building etc and even allowing them to sleep with her in her nest box. She would stand no messing though. If one youngster got a bit above himself (as teenagers do) she would soon sort him out with a quick shoulder charge to put him in his place. This year we did the same. The first two hand reared babies of the season were put in with Becky, and sure enough she took them ‘under her wing’ for a couple of weeks until they were big enough to be released into the wild. Then two more babies were put in the garden. Everything was going well, but two days later I got a phone call from Bill the foster carer to say he had found Becky dead. I went down that evening to find a sickening sight - poor Becky with severe facial injuries, the remains of what was left of one baby which had been ripped apart, but no sign of the other one. The injuries were so severe I thought it had to be a fox, and this was verified the following night with a confirmed sighting of it. This presents us with a big problem on just where is safe these days to release hedgehogs as foxes are now everywhere. The massive decline in the numbers of hedgehogs nationwide coincides with an enormous increase in the numbers of urban foxes over the same period of time. Six foot high fences are nothing to a fox, they can climb anything if they have a mind to. We thought the babies and Becky were safe, after all we had used this enclosed garden for the past twelve years or more, and nothing like this has ever happened before. I know that every wild creature needs to eat / provide food for a growing family, but this was killing for the sake of it—not for food, although the remains of the second baby were never found. Becky will always be remembered and not just because she was an albino. Her injuries were so severe they showed that she must have put up such a fight trying to protect ‘her babies’ right to the very end.